A large Flour tortilla loaded with A Burrito filled with fresh Pulled Chicken, Chipotle Cream Cheese ‘n Sour Cream then smothered with Taos Green Chili ‘n crumble Cotija cheese… plus a seasoned Ground Beef ‘n Bean Burrito topped with Chili con Queso and Pico de Gallo; served with Spanish rice and sour cream. A large Flour tortilla “rolled ‘n stuffed” with our seasoned “Chuck Roast” Shredded Beef, Caramelized Onions, Roasted Red Peppers, Chipotle Cream Cheese and topped with Chile con Queso, melted Pepper Jack and Pico de Gallo; served with Spanish Rice, Refried Beans and sour cream. Stuffed with Vegetarian Refried Beans and served with Sour Cream. Smothered with your choice of Chile con Carne, Taos Green Chile or one of our Vegetarian choices: mildly spiced Chile con Queso, Veggie Red or our roasted Chile Del Norte sauce. Served with Spanish Rice and Sour Cream. A large Flour Tortilla filled with sliced marinated Chicken Breast, mixed Cheeses, fresh Pico de Gallo and Spanish Rice, then smothered with Veggie Red and melted Cheese. Served with Black Beans and Sour Cream. 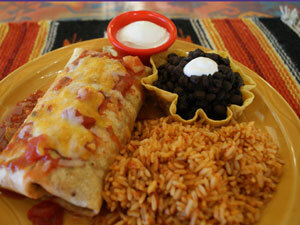 A Bean Burrito with seasoned Ground Beef, smothered with our mildly spicy Chile con Queso. Served with Spanish Rice and Sour Cream. A large Sun-Dried Tomato tortilla “rolled ‘n stuffed” with marinated sliced Chicken Breast, Chipotle Cream Cheese, a “sweet ‘n zippy” Habanero-Mango & Red Pepper Salsa, Pepper Jack Cheese and topped with a ribbon of “Smokey” Chipotle Aioli and a crumbled Cotija Cheese… served with Spanish Rice, Black Beans, sour cream and another helping of Mango Salsa. A Whole Wheat Tortilla filled with a “flame-grilled” ‘n sliced Veggie Patty, Roasted Corn �n Black Bean Salsa, Baby Spinach, Roasted Red Peppers, Pepper Jack and Chipotle Cream cheese; topped with Veggie Red Salsa and melted Jack ‘n Cheddar cheeses; served with Refried Beans, Spanish Rice and sour cream. A large Burrito filled with fresh Chicken, Sour Cream and Guacamole, then smothered with Veggie Red and melted Cheese. Served with Refried Beans. Loaded with Sam’s favorite Southwestern flavors… seasoned Ground Beef, Spanish Rice, Black Beans and Jack ‘n Cheddar Cheeses. 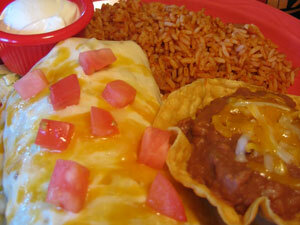 Topped with Taos Green Chile and melted Cheese, with Sour Cream served on the side. Our Chile ‘n Tomato seasoned Shredded Beef wrapped in a Flour tortilla, then smothered with your choice of Taos Green Chile or Chlie con Queso and Cheese. Served with Spanish Rice, Refried Beans and Sour Cream.